Getting from Belarus to Ukraine. Most convenient and easy way to travel. Belarus is Ukrainian Northern neighbour. Both countries are well connected with night sleeper trains which is the most comfortable way to travel. 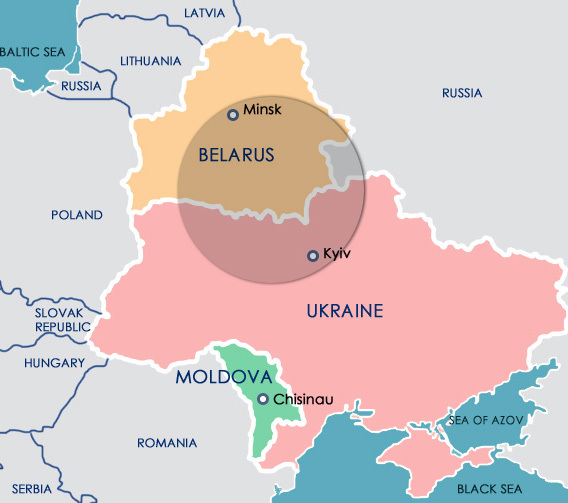 People travelling from Belarus to Ukraine mostly go to/from Minsk either to Kyiv, where it is possible to change towards East and South directions, either to Lviv, the man hub of Ukraine’s West. Cost is 540 UAH (49 EUR) cupe and 340 UAH (31 EUR) ptatzkart. Minsk-Lviv (arr-dep) 01:40-15:18 and 15:51-04:54. Both trains operate only on even numbered days. Lviv-Minsk (arr-dep) 19:02-09:05 in odd days and 23:12-12:30 on even numbered day. Approx. costs are 430 UAH (39 EUR) cupe and 275 UAH (25 EUR) platzkart. There is also useful daily bus between Brest and Lviv. It departs from Lviv Bus station #2 (see location on Lviv map) at 08:30 arriving to Brest at around 17:40. From Brest the same bus deparats at 08:30 arriving to Lviv around 17:30. Ticket is around 140 UAH (3 EUR).For most nationalities Entering Belarus requires a visa, so be sure to check you visa requirements in order not to have a surprise in the middle of the night being took of the train by Belarussian customs.